Greatest Coin from the Greatest U.S. Collection in History! Our Rare Coin Program has been a runaway success. I am happy to say I think we have helped many of our readers achieve the stability, profit potential and non-correlation rare coins can provide. Many of you have seen the quality we provide in the program personally. This month, I wanted to offer you a special coin you can own TODAY! Do you remember reading about the couple walking outside in California who came across an old container holding the largest untouched group of early U.S. Gold Coins ever found? The coin I'm offering is the finest Carson City $20 example graded from that find. So to put it simply, this is the best Carson City minted coin out of the best collection of early U.S. Gold Coins ever found in the U.S.! The recent discovery of the Saddle Ridge Hoard captivated the world like no other numismatic story ever has. For a few weeks earlier this year, the story went 'viral' on the internet, and collectors and non-collectors alike were captivated by this amazing find of gold coins. Close to 1,500 gold coins were uncovered, and only one Carson City double eagle—the example offered here—was graded as high as Mint State-63. Think about it: this is the single most important CC gold piece from the best known hoard of gold coins ever found in the United States! And what a coin this is! 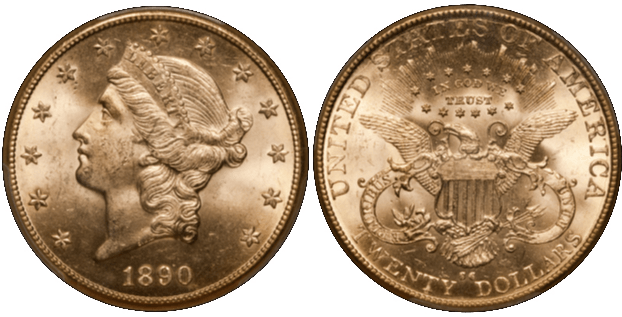 The 1890-CC double eagle we proudly offer shimmers with rich frosty luster and exhibits only a few minor marks in the obverse fields. CC double eagles are usually found with rough, well-abraded surfaces. To find one with this degree of eye appeal is no easy task. As a date, the 1890-CC is typically seen in circulated grades. There are some examples available, from time to time, in the lowest Mint State grades, but in MS63, the 1890-CC is exceedingly rare and no examples have ever been graded higher than this. The current PCGS population is six in MS63 with none finer, while NGC has graded just two with none finer. CAC has approved just this one example in MS63 and, of course, none in grades higher. In Heritage's 2/13 auction, a non-CAC approved NGC MS63 sold for $41,125, and it totally paled in comparison to the present example. As a 'regular' PCGS/CAC MS63, this 1890-CC double eagle is worth around $50,000. With its Saddle Ridge pedigree, it is literally priceless. Its new owner will have a true Trophy Coin which appeals to both double eagle specialists and well-heeled investors who want something truly unique. This wonderful coin is accompanied by its original case of issue, a booklet about the Saddle Ridge Hoard, and a certificate of authenticity. Obviously, there is only one example of this coin available, but keep reading to see how you can add similar value to your rare coin portfolio. How to Jump Start Your Rare Coin Portfolio. I am troubled. When the stock market recently dipped 600 points I received a large volume of calls from people wanting to enter our Rare Coin Program (RCP). Of course, that made me happy, but also worried. The time to enter the rare coin market is before the bubble bursts not because of it. Rare coins are not an exotic investment. They are the new normal in treacherous times when market pressures can decimate your holdings. It's time to jump start a rare coin portfolio with a quick introduction to our ASI Rare Coin Program. All the work is done by career experts and you enjoy the peace of mind as a result of their efforts. Here is a program where the rewards are great and the work on your part is small. The American Numismatic Association's annual mega conference took place in Chicago a few weeks ago. Doug Winter, the world's leading authority on pre-1933 U.S. rare gold coins, was there to purchase more than two million dollars in coins on behalf of rare coin investors. Doug has spent his life studying the features of the best of the best coins. Collector and dealer conferences are his time to shine. He goes on your behalf to purchase coins for you, if you enter our program. This is the ideal time to enter our RCP program. Shortly after the recent 600 point stock market decline, the market rallied. How long will this last? If the stock market corrects, not only will you be shocked by your loss and perhaps stymied with regard to your next step, but your neighbors will be rushing to buy gold and rare coins, ratcheting up those prices. Don't make the mistake of buying high after a loss. What if the bubble bursts and you were already in the RCP, with some of your assets immune from market volatility and fluctuation? You would certainly feel more secure. You wait out the correction, which generally takes 18 months if past history is any indication. Yes, you might even feel a little smug you made the right choice at the right time. What if the stock market stays high? That's the beauty of our program. A compelling feature of rare coins is they are uncorrelated to market pressures and maintain ballast to your portfolio. That is only one benefit of the program. 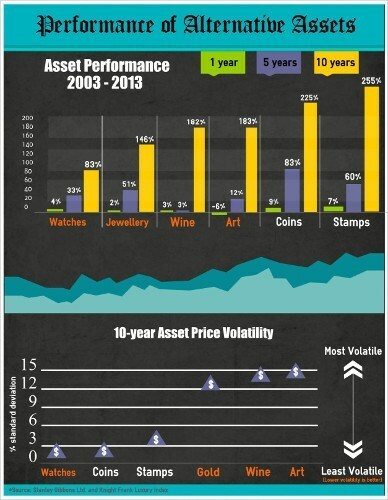 Another benefit - we have seen 10%-11% annual growth in rare coins for the past 10 years. The ASI rare coin program recognizes rare coins lead a double life. For some, rare coins are a luxury collectible. That doesn't mean collectors don't make money along with investors. Rather, collectors tend to use their profits to buy more rare coins, perhaps higher grade, more beautiful, with greater rarity or to finish the series they cherish. As you can see rare coins are one of a collector's top profit-making resources. The ASI program is clearly structured for the investor. If your portfolio took a dive in 2008, you likely needed to make 67% in order to get back to where you started. If you said "never again," our ideal RCP portfolio gives you the jumpstart you want for both growth and safety. Rare coins for investors are managed for profit taking just as stock portfolios. If you are a securities investor, you are probably accustomed to managers making automatic decisions for you and sending you a monthly statement. If you are a mutual fund investor then the internal fund managers are also making changes for you, hopefully to a good result. Although the RCP is meant as a buy and hold program over five or more years, an RCP portfolio is also monitored in a unique way. Doug Winter is a lightning rod for dealers and collectors who approach him on a regular basis. Doug is in a position to make ongoing buy and sell suggestions to you because he spots the right coin, at the right price, at the right time; or because an offer is made directly to him for a particular coin needed by a dealer or collector. Even if you were as knowledgeable as Doug, you could never get the performance returns he does, simply because he is day-to-day in the center of rare coin trades. Whether you would like to add the 1890-CC $20 double eagle from the one and only Saddle Ridge Hoard, or if you are ready to move ahead with your Rare Coin Portfolio, call your ASI Preferred Client Relations Representative at 877-340-0790, today.